Spring! Is it Here Yet? EACH SEASON OF THE YEAR BRINGS IT OWN DELIGHTS, and I enjoy each one as it lingers awhile before giving sway to a new one. There is one season though, that I want to speed up its arrival… and that is SPRING. No doubt about it. I have Spring Fever! I LIVED IN WEST VIRGINIA, KENTUCKY AND INDIANA for much of my life. When I lived those years in the Midwest, as February came to a close, I was so ready for Winter to be over. I was eager to put away heavy winter coats, boots and gloves,… to no longer have cold hands, nose and feet, or have to scrape the car windows of ice and snow. 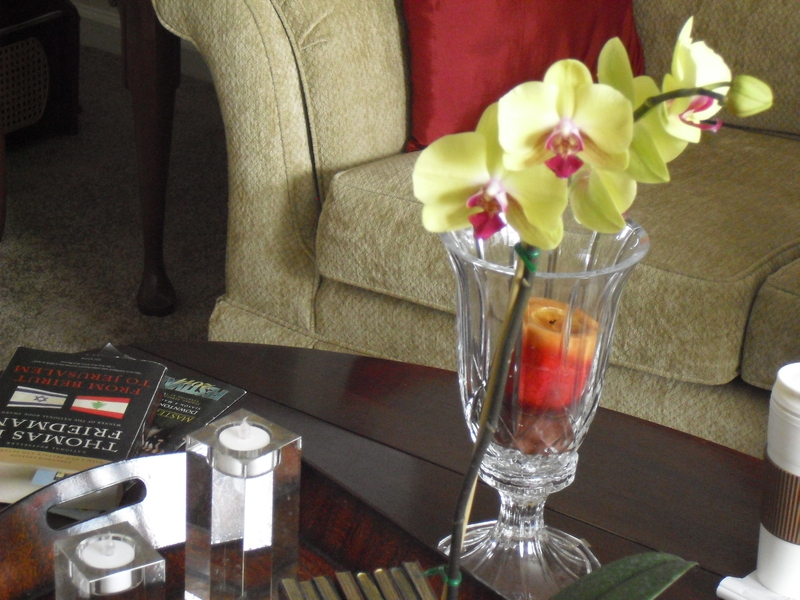 All of a sudden, I seemed to notice the drab winter colors everywhere. Mother used to say, “Don’t wish for Spring too soon. The too warm air colliding with the cold air causes tornadoes”. She was on alert in the Spring for tornadoes as long as she lived in Indiana. I BEGIN TO MAKE TO-DO LISTS for Spring, think about cleaning out sock drawers, and previewing seed catalogs for herbs and flowers. February was a trifle early in the Midwest to look for Spring, but it never failed that each year I developed a growing yearning for Spring to bust forth in all its colorful new growth and warm breezes. I HAVE LIVED IN THE SOUTH for over 20 years now, and still appreciate getting just a little head start on the arrival of Spring …or so it seems to me. One week ago, we had snow for a few days… then it warmed up to 70 degrees. It is cooler today and rainy, but I have started my annual look-out for signs of Spring. Daffodils are up about 4 inches, and red bud trees are in full bloom spreading touches of pinks and rose over the still quiescent landscape. RUNNING ERRANDS TODAY, I was happy to see redbud trees everywhere proudly waving their Spring colors in the wind. THE GRASS IS MOSTLY BROWN, yet to awaken from Winter rest to herald Spring with a showy new green carpet. 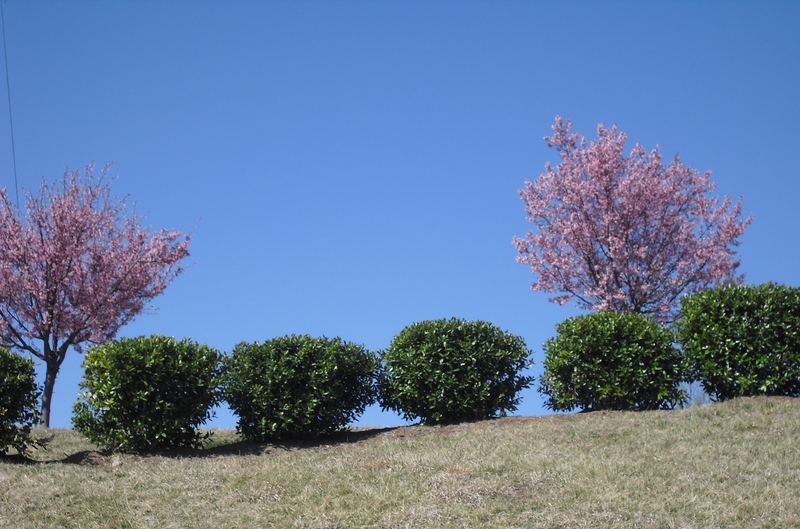 The rosy blooms against the blue Carolina sky are a contrast with the brownish grass…reflecting en environment in transition. WE LUNCHED AT MIMI’S. When we shared it was our anniversary, we were treated to a trio of desserts: apple crisp, bread pudding with bourbon sauce and crunchy brownie with ice cream. 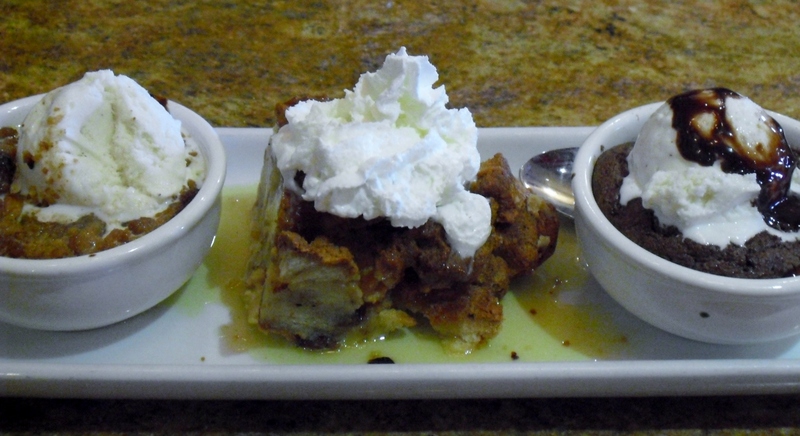 Although I love chocolate, my favorite was the bread pudding…soft, sweet and custardy! I WILL WATCH FOR, and celebrate, other signs of Spring, as I go about my daily chores. 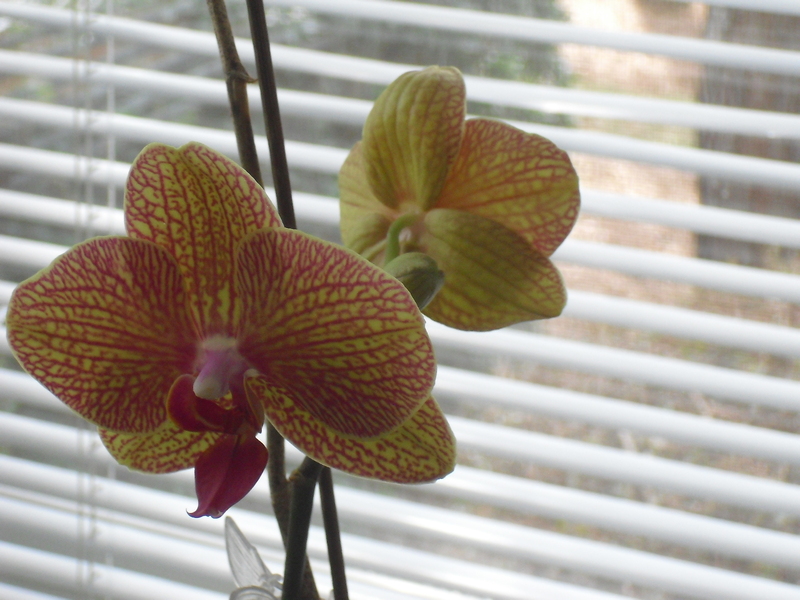 In the meantime, I am grateful two of my indoor orchids are showing their lovely blooming faces to cheer us, as we warm ourselves by the fire and have a cup of hot cocoa and cranberry orange muffins. Do you look for signs of Spring? Previous PostWhat Do You Consider a Good Book?Next Post“Homeless Jesus”: Is it Art and What does it Mean? soul. Surely the Creator had this in mind when all this was set in place. Much love Dear Sister.. . .A. Hello, Sue. The nursery catalogues have been thumbed through several times. We had about a week of relative warm weather but, tonight we’re back down to 17 with 3 inches of ice on the ground plus a couple inches of snow on top of that. So Sue I am sitting here reading all the comments about spring. As a child I would pick little forest flowers called blåveis and I would take the bus to the local hospitals and give them to patients. To me the awakening in spring is not just a season but the renewal of all life, nature and homo sapiens. By now you are remembering that I was from Norway but I have never forgotten when you took me to your home in Madison. I had the Asian flu and you and your nice parents nursed me back to life during the Christmas vacation. By now my emotions are getting the best of me, would love to be in contact. 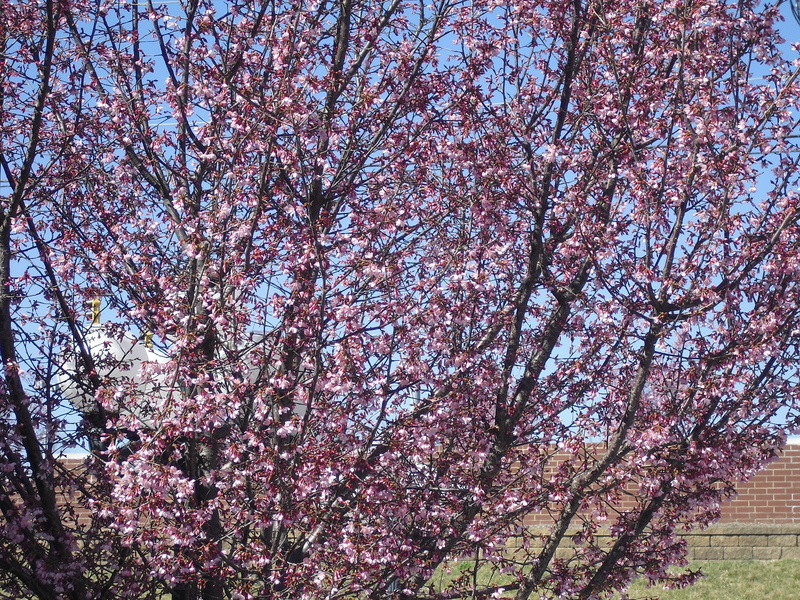 We have trees just like your red bud trees here in the San Francisco Bay Area and they are blooming up a storm, ever since the end of January (since we were in the middle of a drought and the trees thought winter was over, I think). We just got our first rain last week and things are looking up.